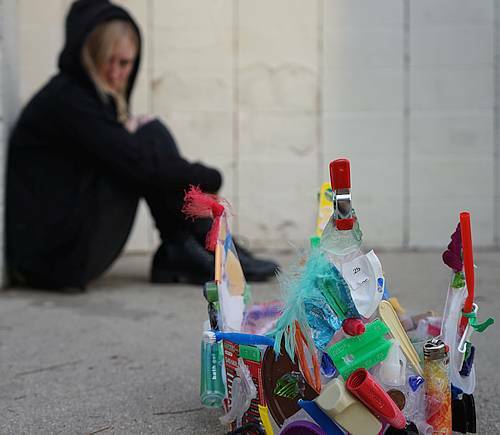 The Cardboard Countess by urbanspine (playing at the Toronto Fringe Festival) addresses issues of teen depression, homelessness, bullying, and environmental decay. Somehow the play manages to be beautiful and hopeful, in spite of its heavy subject matter.The play features Carson Goring as Ever, a rebellious teen who hangs out in a small, trash-filled park next to a suburban mall. She just wants to make music and be left alone. She encounters the Countess (Victoria Goring), a homeless woman who lives in a shelter made of plastic bags and trash. The Countess believes the park is all that remains of her formerly vast domain. She is determined to protect it while she waits for her subjects to return to her. The two characters seem to have little in common. Ever dresses in black with a hoodie pulled over her head and earbuds in her ears. She screams and rages against almost everyone she encounters. The Countess wears a gown, albeit one made of plastic bags. She speaks in formal, flowery language using big words that Ever doesn’t understand. But both are outsiders who don’t really fit in their suburban landscape, bullied and scorned by those around them. And both rely on art to help them survive their pain and suffering. They form a friendship of sorts and help each other navigate their difficulties. When the play started, I was confused at first, as I found the dialogue hard to understand. Ever screams a lot and speaks very quickly. The Countess’ declamatory style sometimes obscured her meaning. But eventually, the play settled into a rhythm and I was able follow more easily. I was also confused by some of the secondary characters. A pair of teens, a mother and young child, and two men enter the scene periodically and interact with Ever and The Countess. None of those characters speak. They just gesture and sort of grunt, which I found a little weird. Victoria and Carson Goring are mother and daughter. They are touring The Cardboard Countess to Fringe festivals across North America (and what a fun way to spend the summer!) The show’s website indicates that secondary actors are recruited at each location. So they probably didn’t have much rehearsal time, and that lack of familiarity with the play definitely showed. On the other hand, I thought the principal actors delivered strong performances. Carson Goring played Ever as sullen and filled with teenage rage and her body language really conveyed her angst and despair. The Countess, meanwhile, was removed from reality, but endearing and determined to create beauty from her dismal surroundings. I thought Victoria Goring created just the right balance of mental instability and believability. In the end, I was surprised by how moved I was by the The Cardboard Countess. The characters grew on me as the play progressed and I found their relationship touching and inspiring. Check it out. Thanks Allison! That was our preview, our secondary cast has calmed down and are doing what they should be doing now…so it’s much more cohesive.